The brand new Mecha style ARPG game that created by top R&D team.The combination of high-end 3D engine technology and western art masters' works, let you experience the future Science Fiction World. The fate of the earth in your hands, build Mechas Legions to sweep out the starcraft invaders, spreading the war to the end of the universe! ——Dozens of awesome Mechas- Heroes incarnated into Mechas, cutting the enemies into pieces! ——Personalized Mechas assembly- Upgrade and strengthen components to create exclusive Mechas! ——Various Mechas attributes- Collect different attribute Mechas to arrange multiple formations! ——Unobstructed view combat- Free full vision combat brings you real-time broken screen combos! ——Group battle- Join Mecha Legions to smash Aliens together! 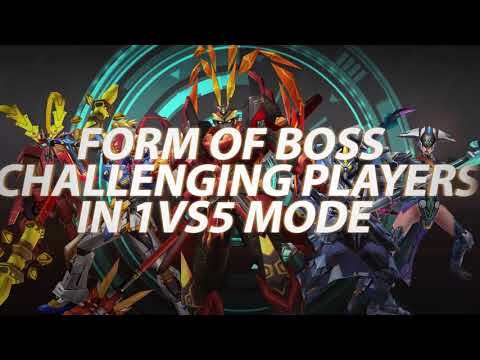 ——Form of giant BOSS- Cross server to act giant BOSS, matching real players in 1V5 mode!